1973 Aston Martin AM V8 ‘garage find’ for auction with CCA on 23rd September. 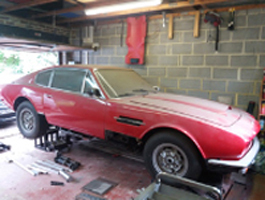 Aston Martin enthusiasts will have the chance to buy a manual 1973 Aston Martin AM V8 ‘garage find’ at Classic Car Auctions’ (CCA) upcoming September Sale on 23rd September at the Warwickshire Exhibition Centre. The high-performance, eight-cylinder, classic Aston Martin is one of just 288 made, mostly with automatic transmission.As with all traditional Aston Martins it was entirely hand-built and is now the perfect candidate for a full restoration. This right-hand drive example has spent the last nine years stored in a garage. After almost a decade of rest, other than a small amount of recommissioning by its current owner, the car is awaiting a new owner to return it to its former glory. 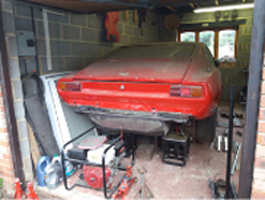 One of just 288 examples made, the car has been garage stored for nine years and is awaiting restoration completion.